Don’t know how to start a conversation on Tinder? Not sure what to say to a girl/guy in a first message on Tinder (or how to respond to their “hey” or “hi”)? Good news is starting a good Tinder conversation is easier than you think. This article will show you how to start a Tinder conversation with exactly what to say to a girl/guy in those first few Tinder messages. 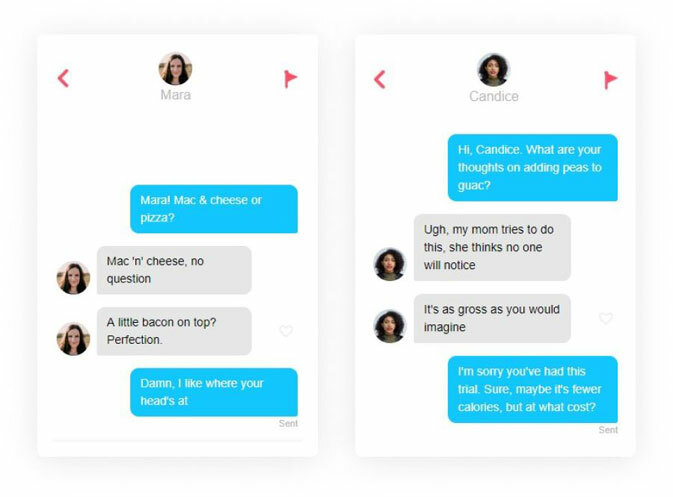 We’ll even show you how to turn the Tinder conversation into a real-life date. This sounds simple, but it’s oh, so effective: using someone’s name as soon as you “meet” them creates a sense of familiarity without coming off as creepy. It also shows you’ve actually taken the time to notice their name, instead of using the mindless copypasta approach. You: Mara! Mac & cheese or pizza? You: Hi, Candice. What are your thoughts on adding peas to guac? You: I’m sorry you’ve had this trial. Sure, maybe it’s fewer calories, but at what cost? Get-to-know-you games (like Would You Rather or Kiss, Marry, Kill) are awesome for starting conversations on Tinder because they give you a topic to discuss immediately. Guys are usually told to start Tinder conversations with a joke, but jokes are waaaay less effective than games. When you start a conversation on Tinder with a joke, what is the desired outcome? She responds “haha”? And… that’s it? If there’s any hope of turning that first message into a conversation into a date, the guy has to start a real conversation from scratch after the joke is finished. Start a real conversation from the output instead — and make it fun with a game! Priscilla: Easy, f John Legend, marry Jon Hamm, kill John Oliver. You: Would you rather go sightseeing in Europe or lay on a beach in the Caribbean? You: Which country would you start out with? Referencing something they said in their bio (and asking a question about it) takes more work than other approaches but can definitely make you stand out. You: So which trail is your favorite for biking? Shayla: Yeah, beats a stationary bike in the gym any day! 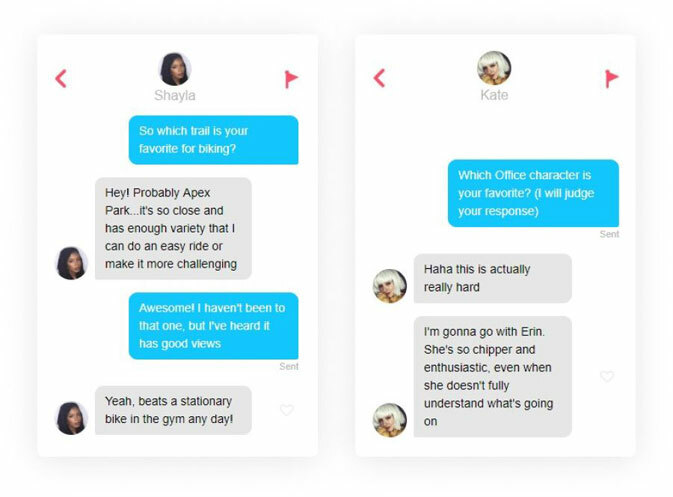 If you used one of the Tinder conversation starter examples above — and avoided lame non-starters like “What’s up?” — you’ll be having an interesting Tinder conversation right away. Her: Yeah, beats a stationary bike in the gym any day! You: So you like being outside. Do you camp too? I literally have never been. Her: WAT. Are you kidding? And you live here? You: haha I know. Well only for the last few years. Never made it out. You go a lot? Her: No, not a lot. But you are. missing. out. You: haha I believe you. Such conviction. You: Are you free at all next week — maybe Thursday? Her: I’m busy Thursday but how about Wed? You: Cool. How’s Cook’s Coffee in Parker? Like 5? Her: Sure. 5 works for me! You: Cool. It’s a plan. Your Tinder pics aren’t just important for matching. They also determine whether your Tinder conversation fails or succeeds. That’s because your profile pics make a huge difference in the way people “hear” your messages. There are academic studies on this. Thing is, if she thinks you look good, she’ll love your messages. If your pics are kind of so-so, there’s always that chance she’ll find your conversation lame or off-putting for no other reason. 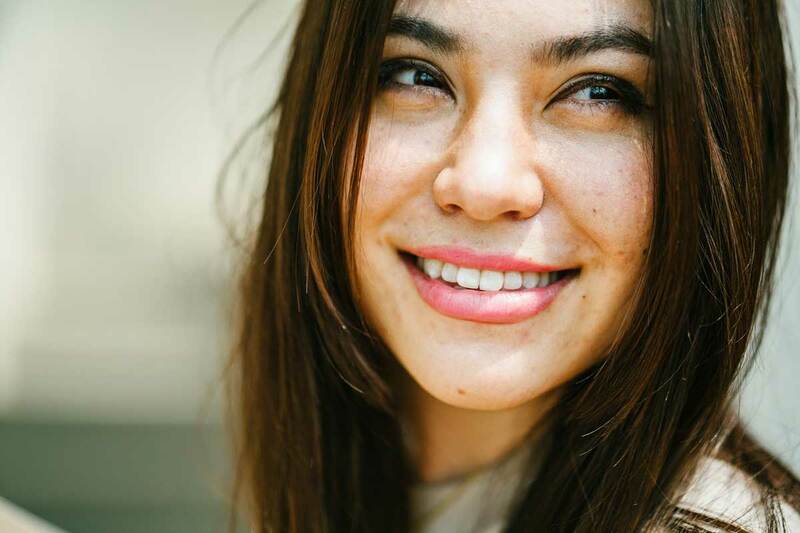 Get more attractive instantly by optimizing your pics on Photofeeler. 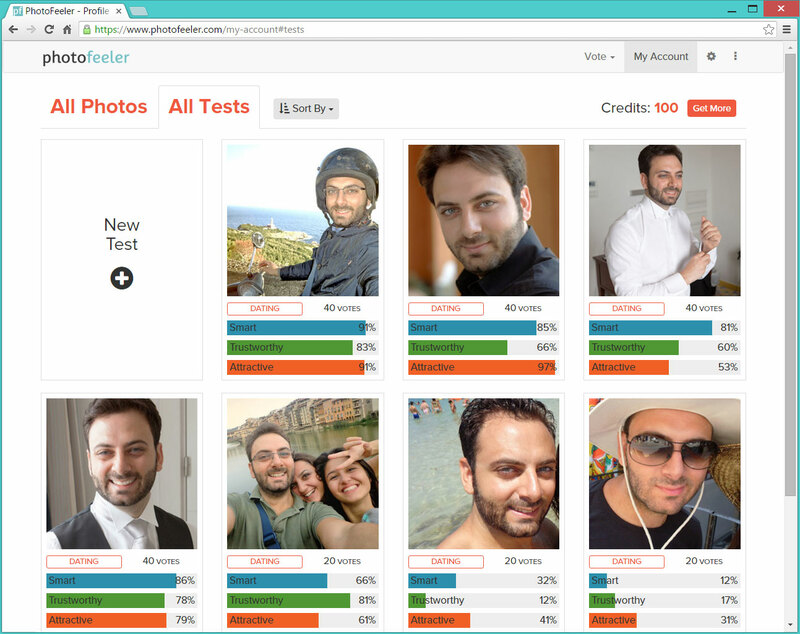 Photofeeler tells you exactly how your Tinder photos are coming across to women or men. You might be shocked at which pics are actually your best!